Westfield chairman Jack Stapley is targeting a top six finish as the football club continues its improvement in form. The Westies have won four of their last five Southern Combination League Division Two matches and have lost only once in seven games. Westfield are currently 12th in the 15-team division, but are only two points behind Littlehampton United in seventh. Sixth-placed Jarvis Brook are eight points above Westfield, albeit having played two more matches. “It’s an absolutely mad league, but it shows what a little run can do,” continued Stapley, who believes a settled squad and converting chances at key times have been important factors behind the upturn in results. Westfield’s improvement will be put to the test when they host third-placed Roffey this coming Saturday before travelling to leaders Angmering Seniors on Saturday January 26. “You probably don’t get two harder sides in this division to play, unless you put (second-placed) Rustington in there,” added Stapley. 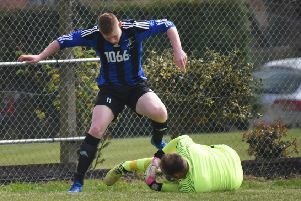 “They (Roffey) have got the league’s top scorer so the onus will be on us to make sure we shut them out, put our bodies on the line, block shots and make sure we finish our chances. Canadian youngsters Tristan Da Costa and Levonte Johnson are expected to return to the squad, giving Westfield manager Mark Stapley the sort of selection problems he simply didn’t have before Christmas. Kick-off at The Parish Field on Saturday is 2pm.